One of the most frequent tendencies in the artists whose work might be considered typical of the twentieth century is the deformation of man. Fleeing from copying reality with the form habitually seen by the human eye, they represent it with alterations aimed at manifesting its deeper aspect. Theoretically there is nothing wrong with that. However, it is noteworthy that when they alter how men normally appear, many of the most typically modern artists actually deform the human form almost to the point of hideousness. Thus it is not difficult to find perfectly conical human figures in modern canvases; a tiny head, shoulders a little wider than the head, waist much broader than the shoulders, legs that appear to grow up to the ankles that are joined to literally immense feet. Other sculptures will show necks that are not merely very large but deformed, showing in one or another point of alarmingly enlarged thyroid glands. In a word, if some magician appeared to any normally sensible man and offered him a potion to transform his body into a typical figure of modern art, his offer would receive an energetic and immediate refusal. This obsession with the deformed, the ugly, or even the hideous has reached the limits of the inconceivable in certain artistic works. Look, for example, at the picture labeled “Our Image” that we publish here. It is the moral figure of the human race as a typically ultramodern artist would chose to represent it. Nobody denies that there are terrible moral and physical deformities in the universe and that it may be licit for an artist to represent them as long as that does not give rise to an offense against morals. However, it is an erroneous position to paint only horror. It is wrong to neither paint nor sculpt except to deform. Such artist act as if the universe were nothing but a receptacle of ignominies. This is an indisputably false and dangerous conception not only of men but the world. At the root of this tendency for the hideous is a desperate and blasphemous vision of the creation which is a work of God. Richelieu by Phillippe de Champaigne Paintings and sculptures made under the influence of that vision deform the soul. Ambiences impregnated with this state of spirit can only degrade man. They extinguishing all the movements of the intelligence and will toward a truly noble, pure and elevated ideal. We present here by way of contrast a picture representing a man in his maturity taken from among the immense number of artistic works of past centuries. It represents much more than the physical aspect of this man, his state of spirit or his moral make up. 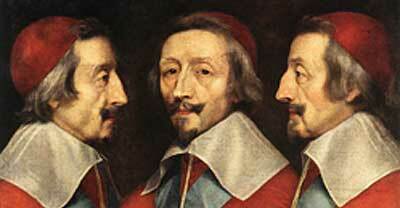 It is Richelieu painted from three different angles by Phillippe de Champaigne. All the qualities and defects of this grand statesman are reflected in this admirable study in which the human soul is portrayed in what is most intimate, lively and subtle. The artist does not have to resort for this end to deformations that degrade human nature itself. 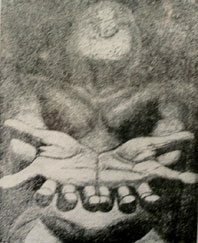 This entry was posted in Plinio Corrêa de Oliveira and tagged alterations, artist, deform, deformation, hideousness, man, Phillippe de Champaigne, Professor Plinio Correa de Oliveira, reality, Reign of Mary, Richelieu by Plinio Corrêa de Oliveira. Bookmark the permalink.